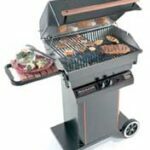 Expert advice on outdoor barbecues and kitchens, with buying guides, DIY installation instructions and diagrams, repair and maintenance tips. The backyard barbecue has come a long way since Dad flipped burgers on the back porch once a year for the Fourth of July. According to the Hearth, Patio, and Barbecue Association, 86% of all households own a barbecue, grill, or smoker, and more than half the barbecuing population now cooks outdoors year-round. Today, traditional-style grills simply do not suffice for the entertaining needs of many people. Now, we have outdoor kitchens complete with cabinets, refrigerators, sinks, and even dishwashers. What has not changed is the appeal of the “barbecue experience” —the flavors and smells, the ease of clean-up, the expansion of the cooking and entertaining area, the relaxed environment. There is just something intrinsically better about barbecuing. Pre-manufactured outdoor kitchens, which can be assembled in a few hours, are readily available, but they can run several thousand dollars. 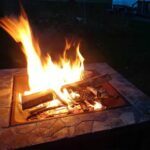 More affordable is the option of creating a custom grilling area for any outdoor entertaining need, and doing the work yourself. Before you embark on a barbecue project, however, you need to ask yourself a few questions. 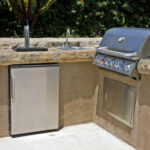 Do you want a simple patio grill, or a fully functional kitchen? What sorts of appliances and storage do you desire? 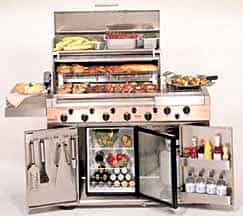 Do you want your barbecue to be built-in or movable? How much space does your backyard have to accommodate the set-up of your dreams, and is that area sheltered and close to existing plumbing, electrical, and gas lines? What are your year-round weather conditions? Are you in the market for a new barbecue? If so, you’re probably aware that a world of possibilities exists when it comes to barbecues. From simple kettles to built-in outdoor kitchens, your options are limited only by your imagination and your budget. You can buy a barbecue completely assembled, ready-to-assemble at home, or as a unit that’s meant to be plugged into a masonry edifice. To choose the right barbecue, you need to be clear about what you want. Budget, of course, can seriously limit your choices. But also think about how and where you will use your new barbecue. Will you want it on the patio right next to the kitchen, or further away in the yard? Should it be permanent or portable? Will you need electricity, water, and gas lines nearby?